When the Bangkok sun relentlessly beams down, cutting through the heaviness of grey smog, and the humidity of Southeast Asia gets to be a bit too thick and suffocating, there is only one thing that can alleviate the unforgiving heat of Thailand -- and it goes by the name of Hale’s Blue Boy. Hale’s Blue Boy is at the center of many celebrated Thai drinks. Since 1959, the syrup brand has been producing flavored liquid sugar in traditional Thai flavors like sala (palm fruit) and mali (jasmine) as well as Western-inspired flavors like cream soda. The brand also carries a grape, pineapple, strawberry, root beer, rose, and cantaloupe flavor -- though you’ll be hard pressed to find these among Thais. The three most iconic flavors are most definitely dang, which translates to red and is the sala flavor; kieow, meaning green and referring to the cream soda flavor, and mali, or jasmine. Pinky milk -- or nom yen -- one of the most famous concoctions invented using Hale’s, looks exactly like what it sounds like: a creamy, blush-colored beverage enjoyed by children and adults alike and made from Hale’s thick, magenta, sala-flavored syrup and milk. It’s refreshing for hot days, delicious as a dessert, and perfect filled with pearls of tapioca balls. It can come served over ice, frothy and hot, or blended into a sugary Thai slushie. It’s something I’ve experienced growing up too. Whether we were praying at altars with offerings of red syrup soda, or having a family dinner together at home, Hale’s Blue Boy had a presence and a seat at the table. My favorite flavor matches chef Kittichai’s -- dang is definitely the superior option -- whereas my brothers preferred the forest green cream soda option. At home, we made every beverage variation possible. We mixed Hale’s Blue Boy with milk (a classic), soda water (something lighter and bubblier), and even tap water (during desperate times). We poured it over crushed ice for a 2 minute dessert sprinkled with corn, beans, and grass jelly. Hale’s Blue Boy was at the center of it all. Across night markets in Bangkok, you can find push carts dispensing the artificially-flavored drink, as well as aunties shaking steel drums of ice, creating traditional Thai popsicles loaded with Hale’s. Some motorcyclists, who double as baristas, have makeshift drink bars attached to their vehicles. The drinks typically come served over ice in a small plastic bag, complete with a straw jutting out -- an easy-to-carry and consume beverage. In Washington DC, a mother-daughter duo that run Thai Chef Street Food, have a fancier interpretation of nom yen on their menu. It’s called the “Unicorn Nom Yen” and has the traditional Hale’s sala base mixed with milk, but boasts a crown of whipped cream and colorful sprinkles on top. “It was definitely my favorite drink as a kid and that’s why I serve Unicorn Nom Yen at our restaurant,” explained Chalisa Fitts, one half of Thai Chef Street Food, who inherited her mom’s love of Hale’s Blue Boy. “59 years ago, when I was a little girl, I remember snow cones were made with hand made shaved ice then poured with different flavors of Hale’s Blue Boy syrup to make layers of different colors,” reminisced Pornnapa Pongpornprot, the other half of the team behind Thai Chef Street Food. 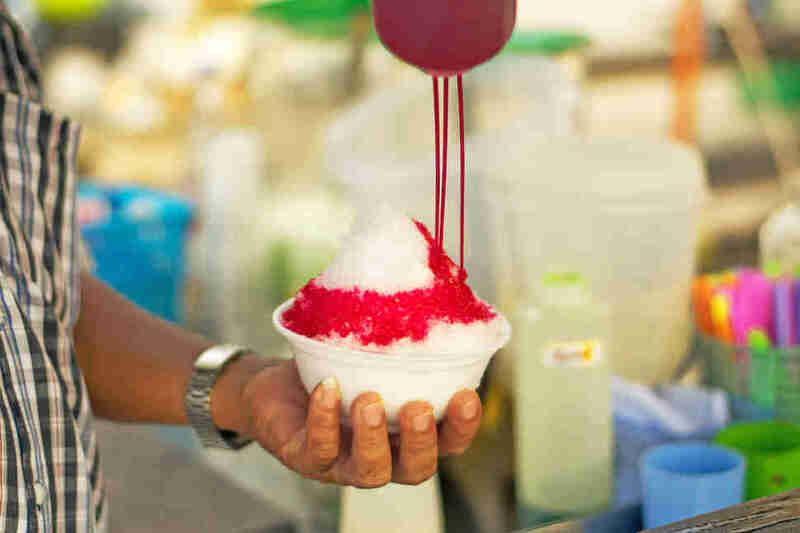 “Thailand is always very hot -- having a refreshing snow cone was always my favorite treat.” The flavor she enjoys the most is, of course, sala. “When I was a little older, nam dang soda became my new favorite.” She says the soda syrup combination reminds her of a Thai interpretation of a Shirley Temple. It even inspired a Valentine’s day cocktail they served, called the Bangkok, which they made with Hale’s nam dang and garnished with a sprig of rosemary. Hale’s Blue Boy is so quintessentially Thai that it seamlessly melts into the pop culture in Thailand. In the wildly popular Thai romcom series, SOTUS, a more serious character named Arthit is found to have a gentler side after revealing his beverage of choice: pinky milk. 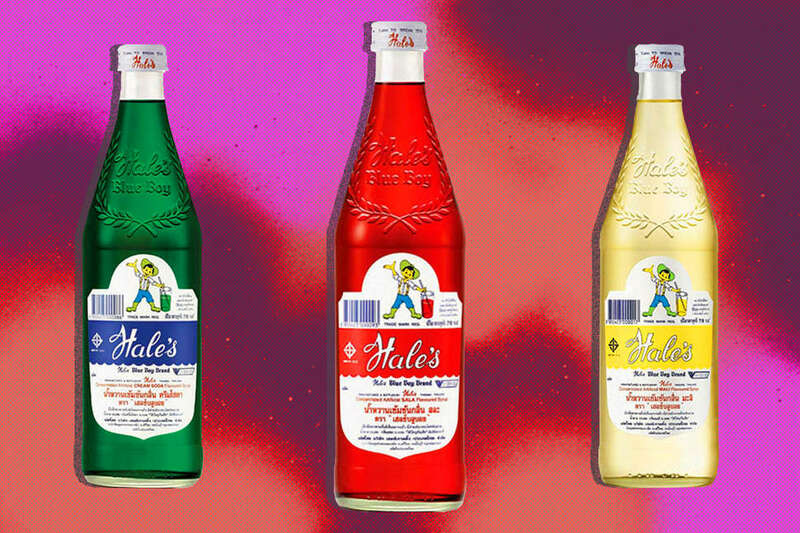 Drinking Hale’s -- especially with milk and especially the pink sala flavor -- is often viewed as an activity and beverage for children. However, adults who drink it are found to be cute and admirable in their childlike behavior. Even Fitts acknowledges this. “I still make it for myself to drink, even now that I’m 29,” she said unashamedly. Kat Thompson is a staff food writer at Thrillist and believes her exposure to Hale's from a young age has fueled her sugar addiction. She's not mad at it though. Follow her on Twitter @katthompsonn.